I don't get it. Are you advocating plaigarism? 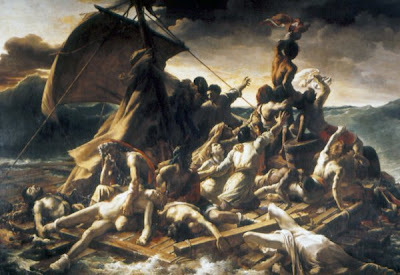 Gericault began by sketching several alternative moments of the disaster, a procedure which he had used in earlier projects. He was initially drawn to five episodes of Correard's and Savigny's account. They were the Mutiny, Cannibalism, Sighting of the Argus, Hailing the Approaching Rowing-Boat and the Rescue. Gericault developed their compositions in concrete detail, concentrating on one after the other, testing each thoroughly before going on to the next. Gericault's characteristic habit of building his compositions was by successive additions and transformations and carried the figure motifs from one compositional version to the next. From Mutiny and Cannibalism's distanced action, Gericault developed his composition of Hailing with the raft close to the foreground as to make the viewer feel transported onto its planks and to involve him in its drama as a participant rather than a detached observer. From the episode of Hailing, Gericault turned to the Sighting of the Argus. Keeping the main features from the previous work, the Sighting retained the closeness of the Raft to the foreground, the diagonal recession of the whole, the coherence of the figure groups, and their orientation toward a point in the distance. The main change is in the relationship between the Raft and rescue vessel. 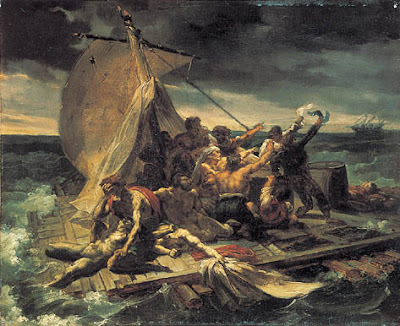 Throughout Gericault further development of the scene, he steadily intensified the effect of extreme distance between Raft and rescue. Taking the Sighting scene as his base, Gericault went on to expand his composition unit by unit. He recorded every step of this process in a separate drawing or a painted study. Whenever possible, he borrowed figures from the discarded projects of Mutiny and Cannibalism, for example the group of Father and Son. obviously you are advocating to write with drama, force, despair, and sometimes sharks. How to write: once every three weeks.